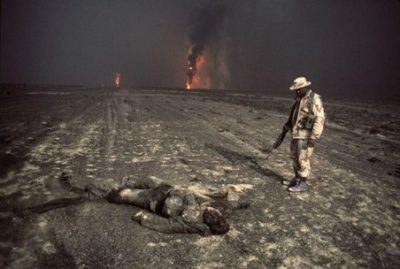 The United States attacked Iraq in the Gulf War in 1990, followed by years of US bombing of Iraq. Then, in 2003, the US invaded and conquered Iraq in the Iraq War. Since then, many US troops have been stationed in Iraq, along with a huge contingent of US government employees and contractors from a variety of agencies, seeking to mold the country to US wishes. Still, 28 years since all this began (and longer since the previous US assistance for the Iraq government it later overthrew), the US House of Representatives approved on Tuesday a bill titled the Preventing Destabilization of Iraq Act (HR 4591). The only way this bill title would make sense given the long history of massive US intervention failing to improve the situation in Iraq is if the bill required the end of US intervention. Instead, the bill seeks more intervention. In particular, the Preventing Destabilization of Iraq Act calls on the US president to impose sanctions on any foreign people he determines knowingly commit “a significant act of violence that has the direct purpose or effect of — (1) threatening the peace or stability of Iraq or the Government of Iraq; (2) undermining the democratic process in Iraq; or (3) undermining significantly efforts to promote economic reconstruction and political reform in Iraq or to provide humanitarian assistance to the Iraqi people.” Further, the bill charges the US Secretary of State to determine if listed individuals should be sanctioned and if people connected to certain organizations should be considered terrorists or sanctioned. In other words, the bill calls for ramping up proven destructive policies for reshaping Iraq. Also included in the bill is a call for action that would help push for escalating the US government’s destabilization project in Iran. The bill says the Secretary of State “shall annually establish, maintain, and publish a list of armed groups, militias, or proxy forces in Iraq receiving logistical, military, or financial assistance from Iran’s Revolutionary Guard Corps or over which Iran’s Revolutionary Guard Corps exerts any form of control or influence.” Thus, claims of Iran’s intervention in its neighboring country can be used to build the case for massive intervention in Iran, up to invasion and conquest of Iran, by a nation thousands of miles away. Not to worry, 28 years from now, the US Congress can approve a Preventing Destabilization of Iran Act.